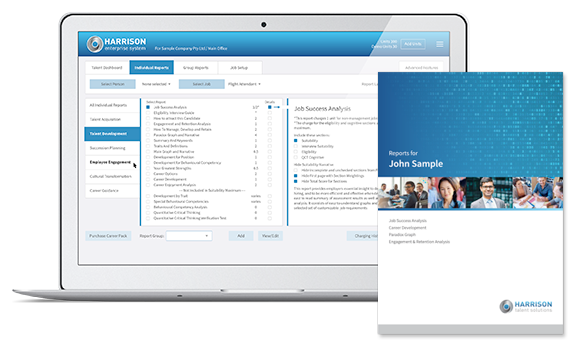 The Harrison Employment Pre-screening enables you to win the talent war by automating the recruitment process. You can reduce the administrative burden of your recruitment cycles by more than 70% and immediately discover the ideal candidates when they apply. Our Talent Dashboard ranks applicants according to how well they meet your ideal qualifications rather than simply having a pool of applicants that meet your minimum requirements. Our Employment Pre-screening includes an eligibility questionnaire that is tailored for your specific job and produces a score indicating how well each applicant meets your ideal experience, skills, and educational requirements. Our employment pre-screening takes less than five minutes to complete, eliminates the need to review resumes (except for the best applicants), and reduces the number of interviews. Other screening methods can easily screen out your best candidates, whereas Harrison employment pre-screening is designed to ensure you screen in the best candidates. For example, if you set a minimum level of experience at 4 years and screen out candidates with less than 4 years, you could easily screen out a great candidate with 3 years' experience who is ideal in every other aspect. Our system solves this problem by focusing on ideal requirements and subtracting points for less than ideal. The employment pre-screening comes with free streamlined applicant tracking features including resume and cover letter collection. Resume's are easily viewed from the Talent Dashboard showing all the candidates in your recruitment campaign. Candidates can be invited to apply using the invitation technology which enables you to determine the assessments you wish to administer, set languages, receive completion confirmations, and send customisable emails. You can also post links to the questionnaire on job boards or on your website. You can create settings for the links, select the assessments to be completed, set languages, and receive completion confirmations. Browse candidates and shortlist any applicant based on their Eligibility score, detailed Eligibility answers, or resume. Then enter notes related to candidates which will appear on the dashboard. Short-listed candidates will automatically appear at the top of the list in order of their Eligibility, Suitability or both. Applicants who don't make the short list can receive a customisable decline email at any time during the campaign, providing an excellent candidate experience. The Harrison Eligibility Assessment is part of the recruitment and succession planning platform which optionally includes behavioural testing and aptitude testing. Each assessment score is displayed on a dashboard as well as an overall predictive score of their likely success in the job. Eligibility Assessment can also be used as part of the Harrison Talent Readiness System to create talent pools from within your organization. The Talent Readiness System provides the same benefits of ranking the ideal candidates, great employee experience, and cost savings.